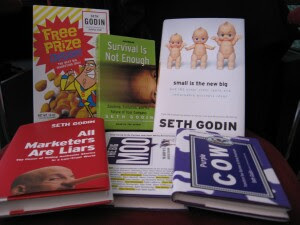 NSP Strategy: Do you want a book? Small is the New Big (ChangeThis summary here). Send me your shipping address. First come, first served. You just have to email me within 60 days to tell me what you got out of reading it. Just one thing. The book, The Dip, was a short, but clear look at how you can become the best in the world at what you do. (The ChangeThis summary). You know how I always say Niche Niche Niche? This book explains why I say that. I don't have any copies of that to give away or his last marketing manifesto, Meatball Marketing. (ChangeThis excerpt here). BTW, his BootStrapper's Bible is still available for download.